This weekend you can find Xûr hanging out at The Rig on TItan . View more vendor/activity details, news, and more below. Destiny 2 | XUR LOCATION & EXOTIC ROLLS! 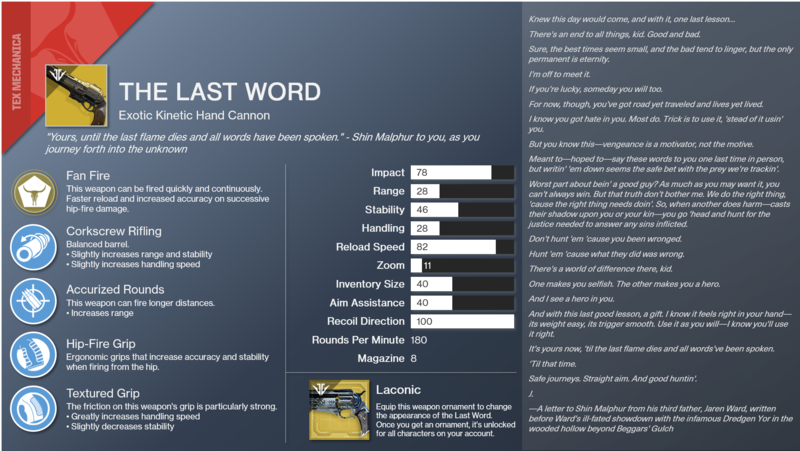 Exotic Weapon, Armor Perk Rolls & More! (25th Jan 2019) << Click link to subscribe for more Destiny 2 videos! Click here to learn more about this quest line! Crimson Days is coming soon. It was originally scheduled to start on February 5. That date is being shifted slightly. Grab your partner and get ready for action and rewards. Full details will be posted closer to the day of release. Resuming the conversation from last week, the following known issues are expected to be resolved with the launch of Destiny 2 Update 2.1.4 on January 29. “Like a Diamond” Triumph: The “Like a Diamond” Triumph is not unlocking for fireteams who complete the “Scourge of the Past” raid in a single session with no deaths. “Always on Time” Sparrow: The “Always on Time” Exotic Sparrow from the “Scourge of the Past” raid cannot be reclaimed from Collections. Modulus Reports to Postmaster: Modulus Reports earned when a player’s Pursuits inventory is full are not sent to the Postmaster. “No Feelings” Kill Tracker: The “Scourge of the Past” raid Scout Rifle “No Feelings” does not correctly track kills when Masterworked to tier 6 or higher. “Rasmussen” and “Satou” Ghost Projections: There is a discrepancy between the assets used in the “Rasmussen” and “Satou” Ghost projections available in the Etched Engram. “Veterans of the Hunt” Emblem: The “Veterans of the Hunt” emblem uses art from the “Universal Hero” emblem, causing the “Universal Hero” emblem to not display properly. For the full Destiny 2 Update 2.1.4 patch notes when they are available, players should monitor our Updates page. 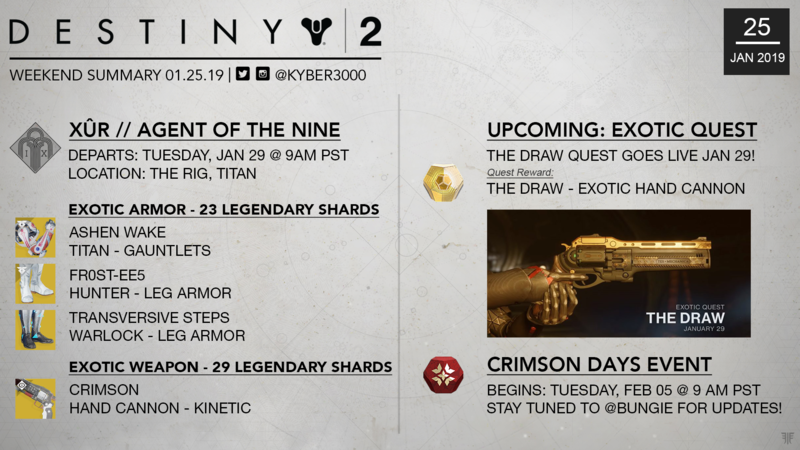 Next Tuesday, January 29, Destiny 2 Update 2.1.4 will become available to players. This update marks the arrival of the Exotic quest, “The Draw,” as well as the expected resolution to issues described in our Resolved Issues Previews—Part 1 and 2. All Destiny 2 players will need to download and install this update when it is available. Please see below for the Update 2.1.4 deployment timeline for Tuesday, January 29. 8 AM PST (1600 UTC): Destiny 2 maintenance is scheduled to begin. Some Destiny Companion features may be unavailable on the web, mobile, and third-party apps. 8:45 AM PST (1645 UTC): Downtime in Destiny 2 will take place at this time. All players will be removed from the game. Players will not be able to log into the game. 9 AM PST (1700 UTC): Update 2.1.4 will begin rolling out across all platforms and regions. Downtime in Destiny 2 is expected to end, but maintenance will be ongoing. 10 AM PST (1800 UTC): Destiny 2 maintenance is expected to conclude. 11 AM PST (1900 UTC): Destiny Companion features will be re-enabled on the web, mobile, and third-party apps. Players who encounter issues should report them to the #Help forum. For live updates on Update 2.1.4 when they are available, follow @BungieHelp on Twitter or monitor our support feed on help.bungie.net. For future deployment timelines when they are available, please monitor our Destiny Server and Update Status help article.